BB101 2018 offers guidelines on ventilation, thermal comfort and indoor air quality in schools. It’s guidelines on ventilation include standards for all spaces including halls, classrooms and specialist areas including new guidance for science labs and other practical spaces. The publication also includes maximum levels of carbon dioxide in teaching spaces and minimum ventilation rates in practical spaces with additional consideration for pupils with special needs. Ventilation is now clearly defined as Natural - NO FAN or Mechanical WITH FAN. If using natural ventilation average CO2 level = 5 l/s per person. If using hybrid/ mixed mode/mechanical vent CO2 level = to 8 l/s per person. Previously many hybrid systems supplied only 160l/s of fresh air in winter conditions. 256 l/s of fresh air is now required to satisfy CO2 level when fan is running. Final ventilation designs will depend on the following main factors: Building location; type of construction; levels of noise ingress; local air quality/levels of pollution; amount of glazing/solar gains; patterns/types of use. Life cycle costs should be calculated so the long term running and maintenance costs of any ventilation system are known. Ventilation is a significant part of the of the total space heating load, particularly in new-build schools with low fabric heat losses. Heating incoming air can be between 20% and 50% of a building’s thermal load and should be reduced as far as practically possible. Additional outside air entering the building in the winter above the minimum required to achieve good air quality is wasted energy. Where mechanical heat recovery (HRU) is to be used the minimum thermal efficiency requirement has been raised to 75% from 70% in order to help satisfy a minimum air supply temperature differential of not less than 5°C lower than room design temperature in UK winter conditions without need for additional heater battery. Thermal efficiency now applies at both high and low speed operation of HRU’s. Guidelines on thermal comfort cover room temperatures and cold draughts with the aim of providing a comfortable environment suitable for teaching and learning, year-round. Using internal heat gains and existing space heating load to temper incoming air to the minimum air temperature via a hybrid ventilation system is widely advocated for standard new build classrooms. Hybrid systems that mix outside air with internal warm air in the winter are less well suited to certain specialist and practical areas or refurbishment schools that have generally higher fabric heat losses. Guidance on designing for children with disabilities who are less able to regulate their temperature than mainstream pupils can also be found in BB101, which offers calculation methods for thermal comfort. Adaptive thermal comfort calculations have been introduced to prevent summertime overheating in school design and reference to CIBSE TM57 is advised. including halls and circulation areas. 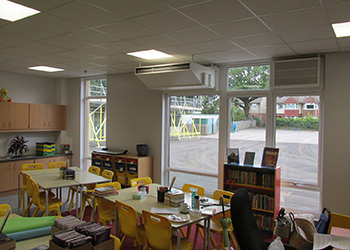 A hybrid ventilation system is often a sensible choice for standard classroom use that will normally insure acceptable internal room temperatures during the summer months are achieved. Guidelines on indoor air quality include a summary of the health effects of indoor air pollutants based on the World Health Organisation guidelines for Indoor Air Quality and the latest advice from Public Health England. There is also advice on how to meet the maximum exposure levels for pollutants including the location of air intakes and exhausts, the management of openable windows, and filtration of supply air. BB101 recognises air filtration is the most cost effective solution currently available to reduce harmful particulates entering the building. to achieve BB101’s low energy requirements for ventilation equipment. Areas with high air pollution from traffic may want to consider local road closures or diversions adjacent to school so other forms of unfiltered air ventilation, including natural ventilation, can be used. BB101 2018 contains 162 pages of regulations and guidance and gives a more detailed holistic approach to the internal environment in schools. As this document is the benchmark for schools it’s important that it is well understood by those actively working in the education design sector. BB101 should be used in tandem with BB93 Acoustic design of schools-performance standards (2015), which outlines regulations relating to acoustic requirements. While not being too prescriptive, to allow designers to use innovative energy saving solutions, it does offer a better framework to steer sensible choices for building services equipment that should result in building better schools.